Chris Mirams is Director of Meat and Livestock Australia (MLA). He is an agricultural consultant based in Albury and has extensive commercial and practical experience in southern Australian sheepmeat production and managing sheep enterprises covering prime lamb, wool and meat with the latest technology and benchmarking. Chris has signiﬁcant experience in strategic research and development, broad commercial experience in southern beef production, specialist skills in business, ﬁnance, corporate governance, communication and leadership. 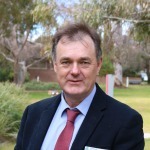 He participated in the Australian Rural Leadership Program, is a past Chair of Holbrook Landcare Network and EverGraze National Advisory Committee and served on the Alpine Valleys Community Leadership Program and Scots School Albury boards.